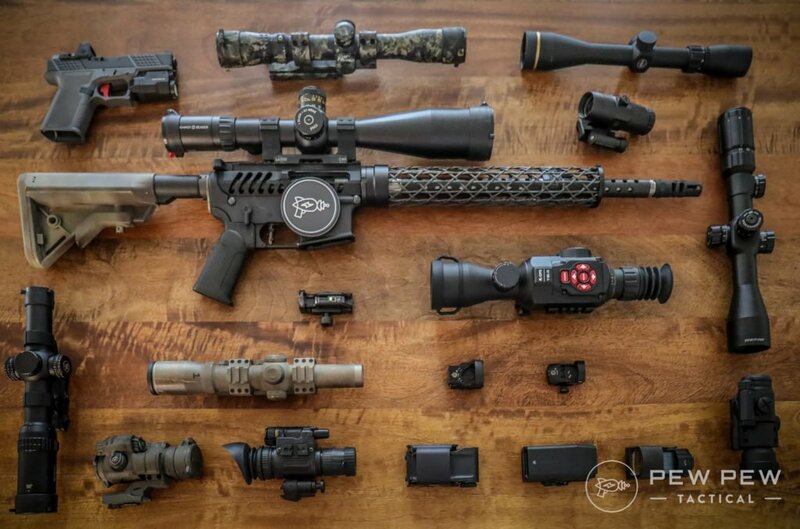 There’s a perfect AR-15 out there for you and we’ll help you find it. By the time you’re done with this guide, you’ll know everything about how the AR-15 works and how different configurations affect performance. We’ll start with our best AR-15’s across all budgets. There might be some jargon in there you don’t understand. But don’t worry…after the list we’ll deep dive into individual parts, the best manufacturers, and more about each rifle choice. Impeccable reputation and has all the stuff I prefer in an AR-15. A DD was my first AR-15 and still has the most rounds through. However…greatness does come at a price. Still an awesome reputation for quality and reliability but at a slightly lower price point. Another top tier manufacturer (see our complete list of top, middle, and budget tier below). Full-review here. Available at almost all local gun shops (LGS) and what I’d recommend if you are ok with a carbine-length gas system (more on this below). Another super popular and readily available model with a carbine-length gas system . One of the go-to companies for AR-15 uppers/lowers…they make everything in-house to keep prices low. I also cover their free-floating handguard models in our in-depth section below. When you want to go budget but still need the reliability. PSA makes everything in-house to cut down on costs and is known far and wide for stuff that works. They have a ton of models so check out my personal picks at the end. Full review of three tested models. Now let’s get get to why these are our top picks. Or if you want something harder hitting…check out the AR-15’s big bro…in our 7 Best AR-10s. Or rather, it looks like the M4’s and M16’s used by the US military. The civilian AR-15 is a semi-automatic rifle compared to the automatic/select fire capabilities of the military versions. That means one press of the trigger is a single PEW! instead of a fully-automatic where a single press of the trigger will be a continuous stream of PEW! PEW! PEW! until you let go. Admit it…there’s a little coolness factor in holding the symbol of America’s might. The AR-15 is very light recoiling when chambered in its native 5.56x45mm round. And is also very ergonomic when compared to other popular rifles such as the AK-47. And the upper receiver, which can be swapped out in a matter of seconds. Only the lower is the serialized firearm so with one lower you can have several uppers to fulfill any role without additional paperwork. The lower holds the trigger mechanism and for the most part, you can swap out the upper for even different calibers, from the .22LR to the .50 Beowulf. There are also tons of aftermarket products to customize the look, feel, and performance of your AR-15 to match your personality and intended use. In my opinion…it’s your gun and your money, so do what you want to do as long as it’s still safe and legal. But…the above AR might have gone a little overboard! See all our suggestions at Best AR-15 Upgrades. Want to get a glimpse of how easy it is to take apart and clean too? Eugene Stoner developed the AR-15 as a lightweight 5.56x45mm version of the 7.62x51mm AR-10 while working at Armalite during the 1950s. The lighter bullet enabled infantrymen to carry more rounds. And that’s always a good thing! 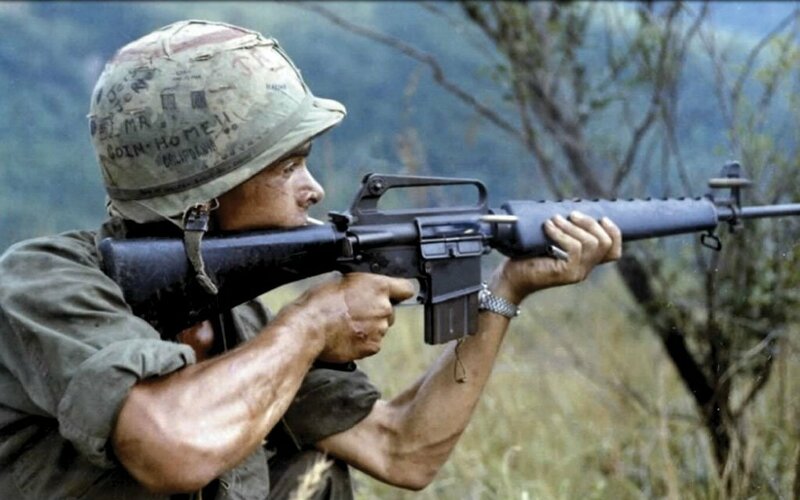 After some tweaks, Colt introduced the M16 which was select fire (automatic) and mostly had a 20″ barrel. The M4 came about in the 90’s and had a 14.5″ barrel with a carbine gas system. Carbine just means that it has a shorter barrel than the rifle version and can either be pronounced “car-BEAN” or “car-BYNE,” but my preference is for the “bean” version. 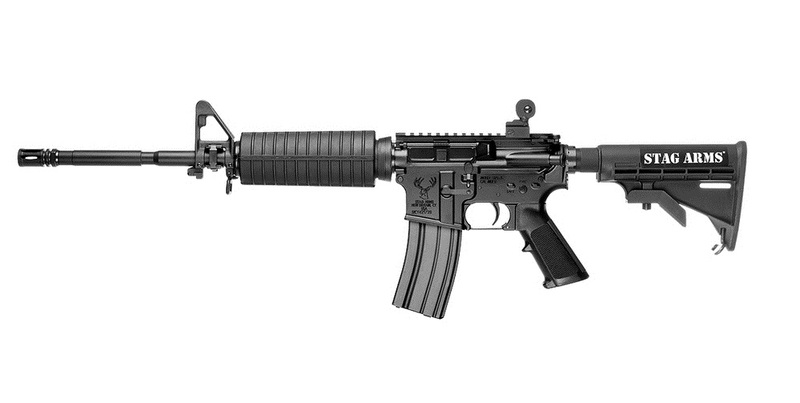 The AR-15 is the civilian semi-automatic version of the select fire M4. 1 press = 1 PEW! Colt owns the rights to “AR15” and “AR-15,” so most other manufacturers have slightly different names, but the general public still refers to the general pattern as AR-15’s. AR-15: To Build or To Buy? For a first AR-15, we would heavily suggest buying a complete rifle from a reputable manufacturer. 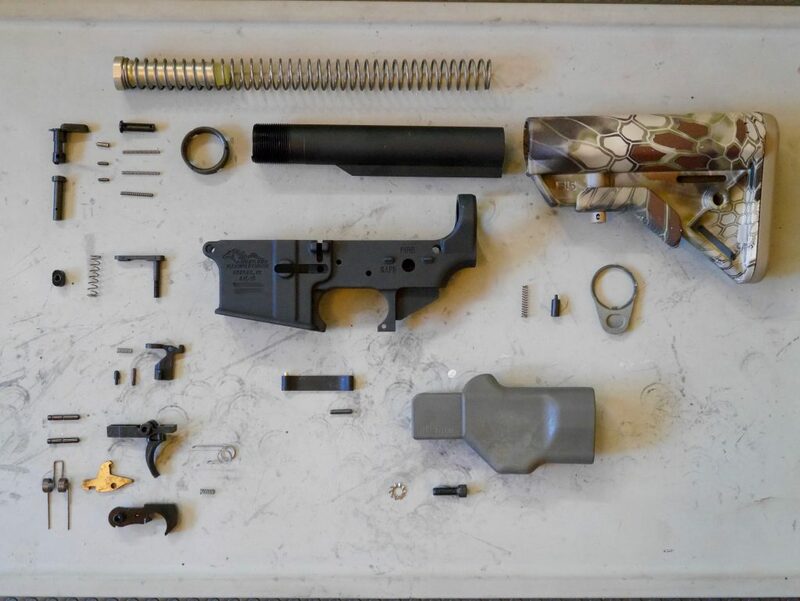 Or at the very least, get a complete upper (Guide to Best Uppers) and build your own lower. 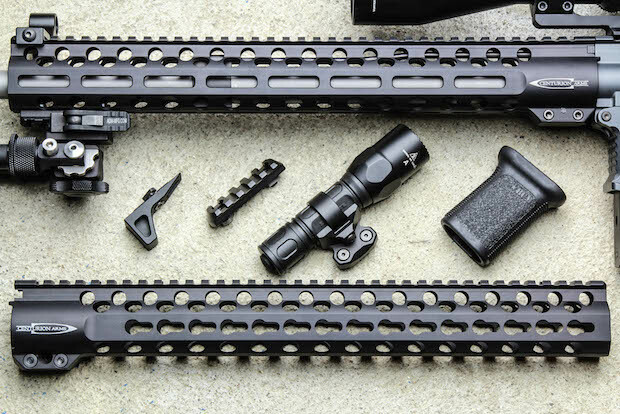 It’s like Legos for big kids and you can see our recs at Best AR-15 Lowers. 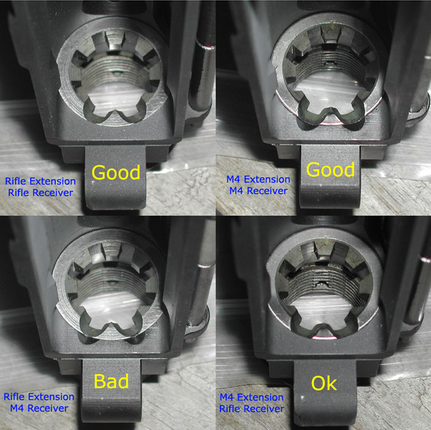 Now there are also options to simply get a complete upper AND a complete lower. This way saves some money too since companies are charged a 11% tax on complete firearms. Buying complete eliminates a lot of possible headaches by having a solid warranty behind your gun. Plus, if you’re just starting off, you probably don’t know what you like/want, so I recommend just going with a standard configuration. A factory gun doesn’t cost that much more than building your own (and nowadays it’s likely less), and you’ll get a much better resale value if you ever decide to part ways (or upgrade). However, there’s something very satisfying about building your own “franken-gun” or “M4-gery,” but we recommend doing it for a 2nd or 3rd AR-15. It’s not terribly difficult and you’ll get to choose every component in your gun. But we think you’ll make better decisions after spending time with a factory gun first. 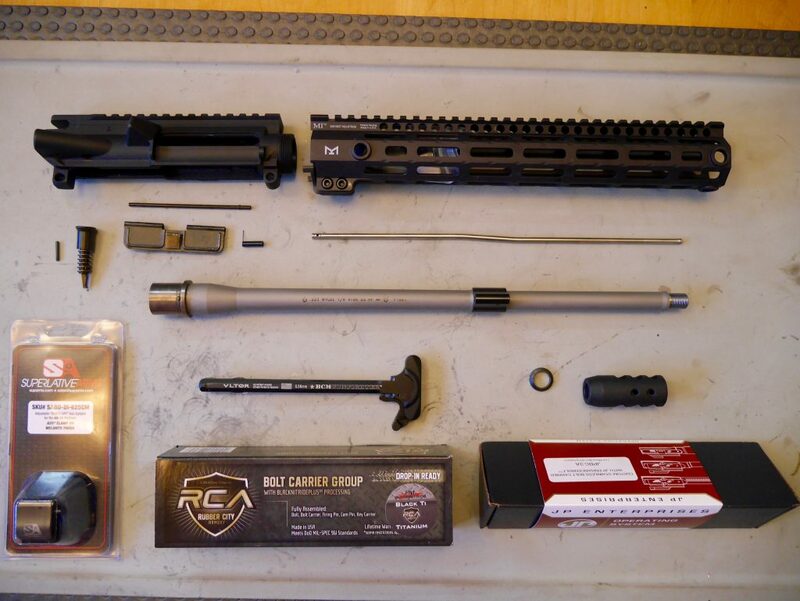 If you’re curious, check out our How to Build an AR-15 Lower Receiver and Upper Receiver articles just to see your future. Next, we dive into the various parts of the AR-15 before putting it all together and recommending specific combinations based on your intended use. We begin the breakdown of the AR-15 system by covering the various characteristics of barrels (the thing that bullets come out of). Now the real fun is going to start! The barrel chamber means the part of the barrel where the cartridge sits before firing (ie, what ammo it can shoot). 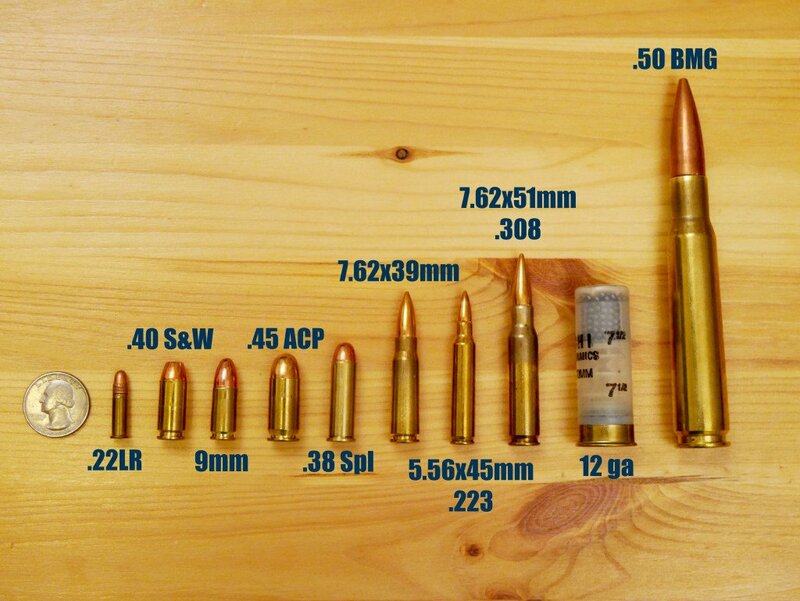 Since this is a beginners’ guide, we’ll focus on the most common 5.56x45mm NATO and .223 Remington. There are tons of other chamberings from .22LR to .50 Beowulf, and a slew of new .30 caliber offerings. The 5.56 is the more common choice compared to .223 since it gives “looser” tolerances and can withstand the higher pressures of the 5.56 round. Federal law states that the minimum barrel length of a rifle must be at least 16″. 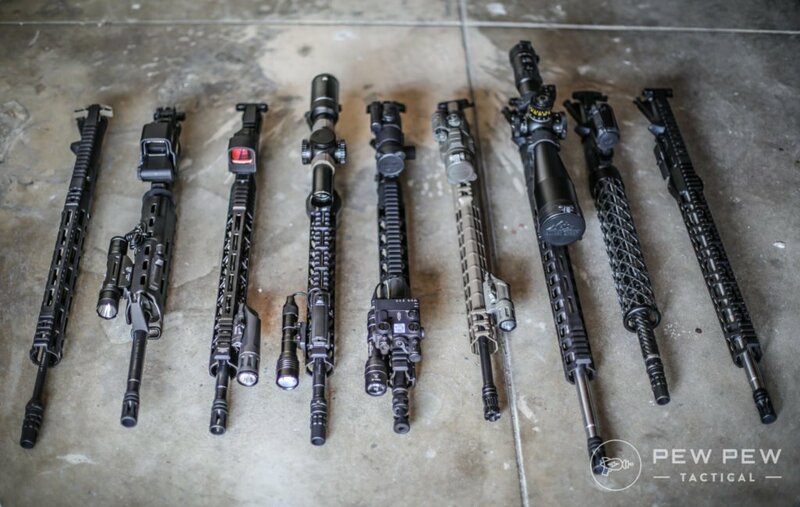 This includes muzzle devices, such as flash hiders, muzzle brakes, or compensators. However, if the device is to be included in the length, it must be permanently attached. For example, you can have a 14.5″ barrel and permanently pin/weld a muzzle device to make it over 16″ to make it compliant. Please note, there are some state/local laws that might govern the types of devices allowed, and even having a 14.5″ barrel might be illegal without appropriate paperwork. Therefore, we recommend beginners get at least a 16″ barrel so they can switch out muzzle devices to their liking. Most common lengths include 16″, 18″ and 20″. Having a longer barrel doesn’t necessarily mean more accuracy. You can get plenty of accuracy out of 16″ since it is shorter and therefore stiffer and less susceptible to barrel whip (movement of the barrel during shooting). However, a longer barrel gives you higher velocity since there’s more room for all the powder to burn. 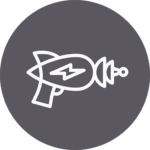 And faster moving bullets give the environment (gravity and wind) less time to affect the trajectory of the bullet. The average 16″ barrel is good for up to 400 yards, but after 300 yards, the standard 55gr projectile becomes more susceptible to environmental factors. 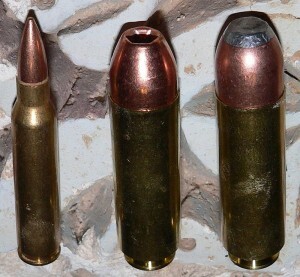 For longer distance, you would want a heavier and longer projectile such as 62gr, 77gr, or 80gr bullets. 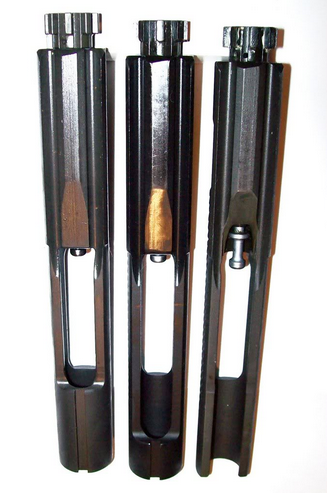 Lastly, there’s also the issue of portability…shorter barrels are easier to move and weigh less. 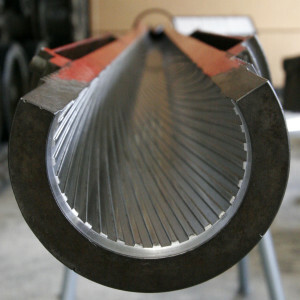 Another number you’ll see when looking at barrels is the twist rate of the rifling. This is denoted as 1 x number (1×9) which means “one twist per 9 inches”. In general, the longer a projectile, the faster the twist is needed (a smaller number in the twist since that means one turn happens in a shorter length). 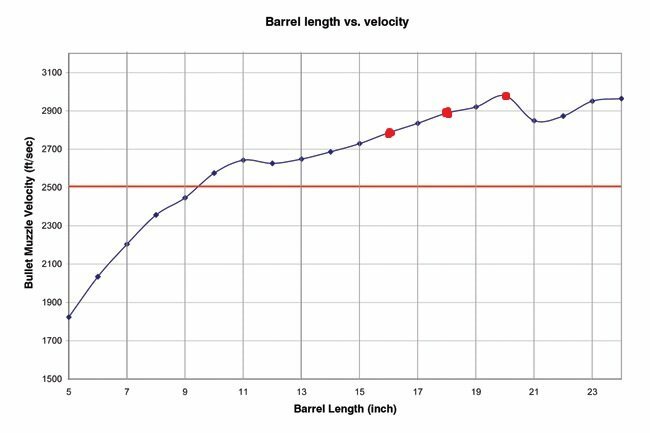 Below is a great chart to show you the ideal bullet weight for the twist of a barrel. 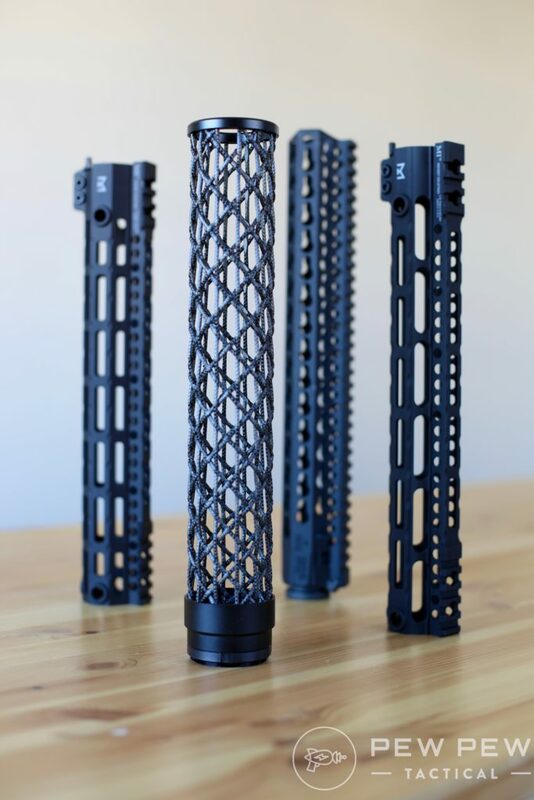 The most common AR-15 twist rate is 1:9 since 55gr is the most commercially available while the most common mil-spec twist is 1:7 since they need to stabilize longer/heavier tracer rounds. For the average shooter just go with the 4140/CMV. Unless you’re firing full-auto a lot, you probably would not reap any benefit from 4150. Except for a lighter wallet…but that probably doesn’t count as a benefit. Chrome Lined: Coating that makes your barrel last longer at the price of a slight decrease in accuracy. You’ll see a gray ring around each end. Ferritic Nitrocarburizing (FNC): Also known as Tennifer, Melonite, or Nitride. Treats the surface of the barrel instead of a coating for possibly better accuracy but with additional cost. Real round counts will differ based on a lot of factors (heat, environment, your definition of “accuracy,” etc), but you can expect around 10-20k before you have to re-barrel. Good, here’s some more acronyms manufacturers will throw at you. None: No testing. You get what you pay for. You might run into the use of “batch tested” which really doesn’t mean much. The manufacturer may test 1 out of 10 barrels or 1 out of 100K barrels. For a home defense rifle, we recommend getting a barrel that is both MP & HP tested. CFH and BFH reduce accuracy a little but you gain a much more durable barrel. If you plan on shooting thousands of rounds a year, it might be worth the extra cost and push you towards a 20k+ round count. CAR (Colt Automatic Rifle): Just a specific family of AR-15/M-16 rifles from the 70’s. Now just a general term for carbine-length rifles before the advent of the M4. Heavy (Bull): Stiffer and heavier but more accurate. Can take a lot of heat before shooting groups start to suffer. Normally used for precision builds. .936″ in diameter. Medium (Government or M4): All around balance. M4 contour has a cutout for grenade launchers. .750″ in diameter. Light/Pencil: Lighter but more susceptible to heat from rapid firing. .625″ in diameter. For the average plinker, Medium or Light barrel contours will work great. 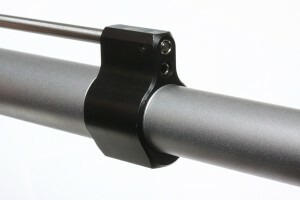 This is an integral part of the upper receiver and you want it to be a proper match with your barrel. The jury is still out whether or not they help reliability, but the main thing is to match up the ramps with your receiver. If you’re buying from the factory, this should not be a problem. But you still might want to check. Now that you’re a pro with AR-15 barrels, we’ll go into the gas system. 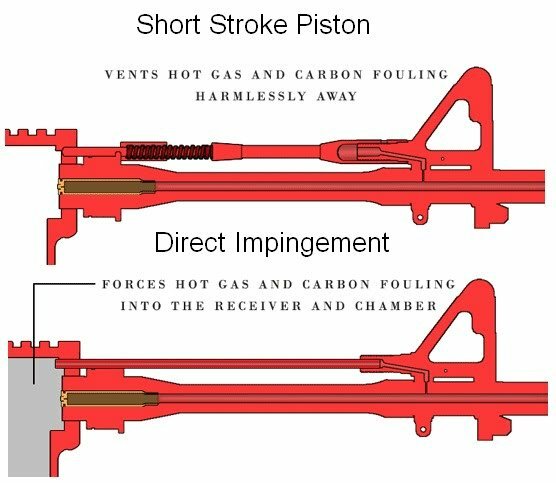 There are two major types, Direct Impingement (DI) and Piston. DI is the original design while piston only really became popular within the last few years. An AR-15 works by directing the hot gas behind the bullet into the gas tube (where the triangular front sight block is above) which then uses the gas to either move a piston or send it directly back (direct impingement). When the force is applied, it makes the bolt unlock, move back, expel the spent casing, and strip a new cartridge into the chamber. The vast majority of AR’s are direct impingement instead of piston. Unless you’re needing to shoot coming out of water or in very dusty environments with limited ability to clean, a direct impingement system will work fine. 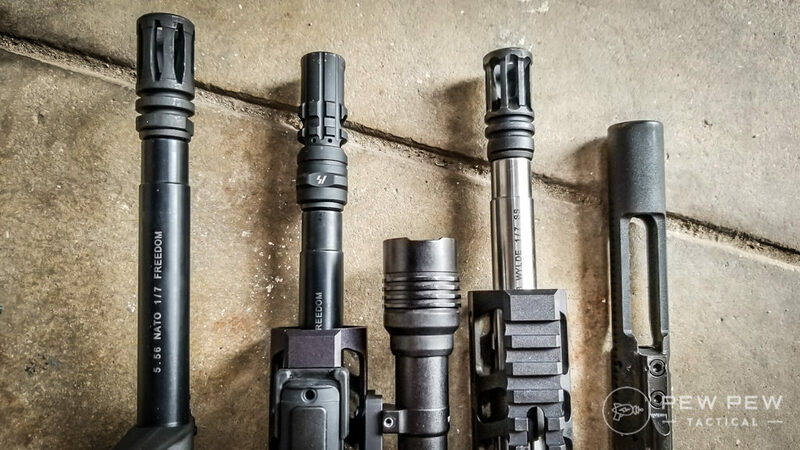 If that’s you…here’s our review of the Best AR-15 Piston Uppers. With proper maintenance, a DI AR-15 is a very reliable weapon and what the military uses. The gas system length refers to the distance to the gas hole, or where the triangular “front site base” or FSB sits on each barrel above. 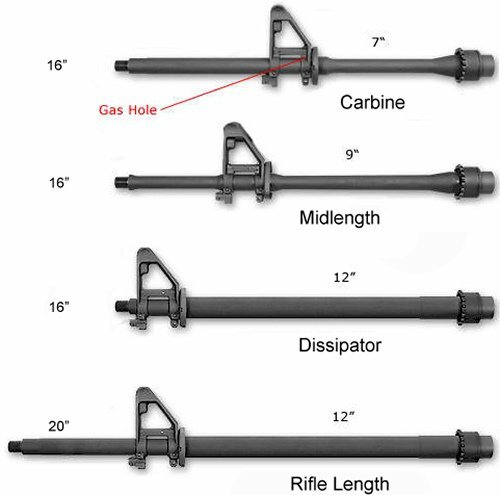 The rifle length gas system is traditionally used for 18″ or longer barrels, but there is the oddball “Dissipator” model which has a rifle length system on a 16″ barrel. 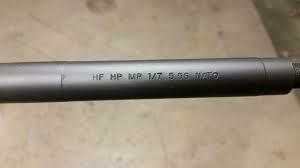 For 16″ barrels, the primary choice is between carbine and midlength gas systems. We believe the midlength has the advantage since it allows a longer sight radius if using a front sight base (which doubles as the front sight). It also gives you more possible handguard/rail space since the handguard goes from the upper receiver to the front sight base. It should also theoretically offer a smoother/softer shooting rifle since the increased distance will allow gas pressure to lower before going back into the rifle. But, this is influenced by a lot of other factors including gas port size, buffer, and spring combinations. For the majority of this article, you’ve been seeing the front sight base (FSB) style gas block which combines the front sight with the gas block. For years I’ve been recommending this style for beginners for the ease of already having a front sight, robustness (the FSB is pinned to the barrel), and cost efficiency of a non-free-floating barrel. You can also choose to grind down the FSB to fit a free-floating barrel later. BUT…there are many AR-15’s that now offer low profile gas blocks that enable a factory install of a free-floating barrel. 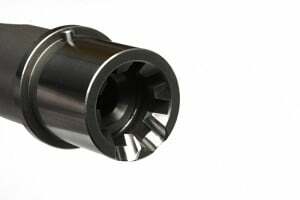 Some of these gas blocks are also adjustable so you can choose just the right amount of gas to make your rifle/ammo combination run smoothly without unnecessary recoil. 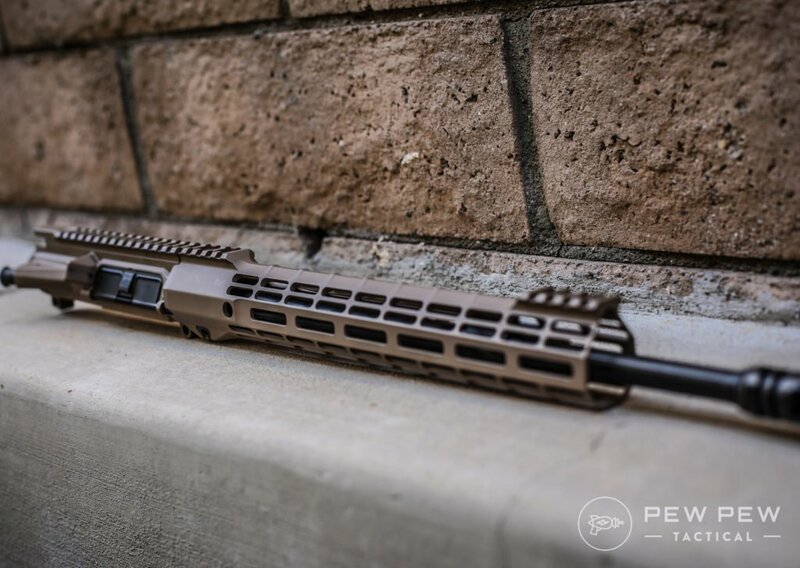 If you know you’ll want to add stuff to your AR…skip the headache of grinding down the FSB or getting a new upper…and start off with a free-float handguard. Front sight blocks almost always force you to utilize non-free-floating handguards. This means that the two-piece handguard touches the barrel at the FSB and can add some inconsistency in force that makes it slightly less accurate. But for non-competitive shooters, you’ll be fine with a non-free-float. There are some aluminum variations, but most are polymer which still works great and are more affordable. 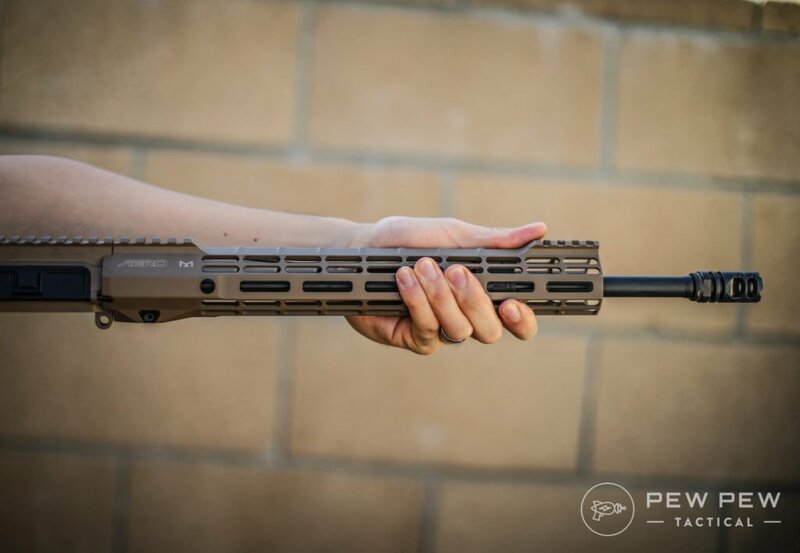 The above Magpul MOE Handguards for Carbine or Mid-Length still allows you to add Picatinny rails on the slots to attach accessories or use their new M-LOK attachment system directly. Picatinny rails were the gold standard of rail attachments and look like raised rectangles. Below is an example of a “quad-rail” since there are Picatinny rails on all four sides. The big con was its weight. And of course, you’ve seen the free-floating handguards for low profile gas blocks. This allows more consistency in your shots since there’s nothing touching the barrel along the handguard. Those usually cost $100-200 more but allow tons of rail space. And also save you a bunch of weight. I prefer M-LOK over KeyMod, and so does the military now. If you can’t wait to see handguard upgrades, check out Best AR-15 Handguards. Essentially the engine that runs the AR-15. 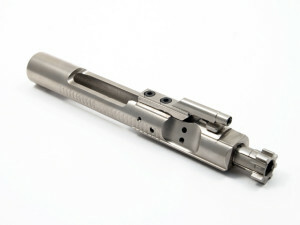 The bolt is housed within the bolt carrier and together they make up the bolt carrier group (BCG). It moves back when you pull the charging handle back. 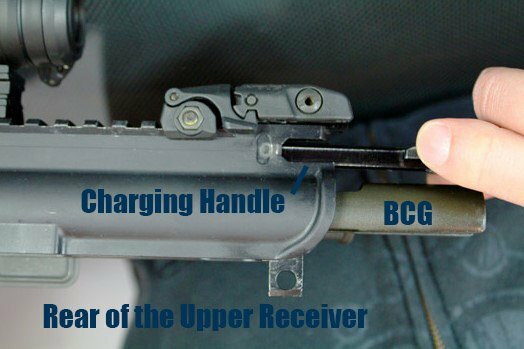 And when you let go of the charging handle, the BCG moves forward, strips a round out of the magazine, and puts a round into the chamber. When you pull the trigger, the hammer releases and strikes the back of the firing pin which is also in the BCG. The firing pin hits the cartridge’s primer which sparks the gunpowder and sends the bullet down the barrel. Then the gas system comes into play. The BCG comes in semi-auto (SA) and full-auto (FA) varieties. Having a full-auto BCG does not instantly make your gun automatic. Normally it is used to slow down the cycling rate due to its increased mass (see the right ends of the BCG’s below). Note that they should be overall the same size but the bottom FA is shrunk in the picture. The full-auto has a shroud to protect the firing pin from hitting the hammer during re-cocking. You can see the right-most BCG has more of the firing pin exposed and less weight on the bottom, making it a semi-auto version. It doesn’t really matter which one you get, but most higher-end manufacturers will put in the FA BCG. Most guns are over-gassed so they can run a larger variety of ammunition, so the additional mass and firing pin protection are advantageous. What do I mean by over-gassed? 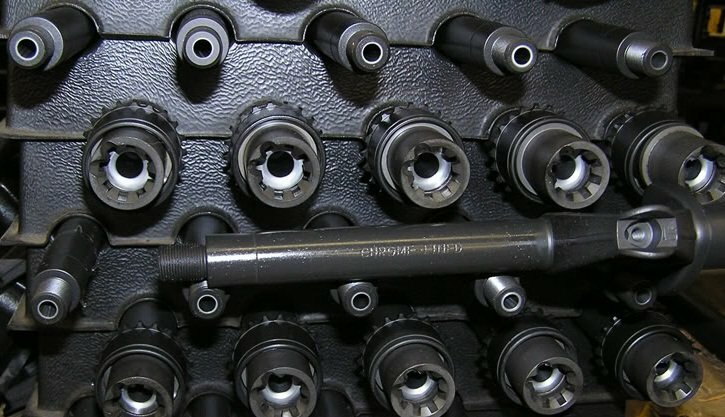 In an ideal world, the gas block would send back the bare minimum amount of gas to move the BCG back so it can eject the spent casing and strip another round. However, there’s the problem of weaker ammo which would produce less gas, and also the crud that accumulates and can slow everything down. Therefore, manufacturers usually let a much larger amount of gas cycle through to brute force through the issues. A heavier BCG and shrouded pin minimize the negative effects of a lot of gas. One of the newest crazes is to have coated BCG’s that are supposed to make them easier to clean, require less lubrication, and run longer between cleanings. Nickel boron is the flavor of the week along with Titanium Nitride, Hard Chrome, and Black Nitride. If you’re running your gun hard constantly or use a suppressor which deposits more gunk back into your BCG, you might benefit from a coated BCG. Otherwise, keep your regular BCG clean and lubed and it will run just fine. Or…check out our Best BCG’s article for our favorite picks. This comes up more when you are building a lower from scratch. 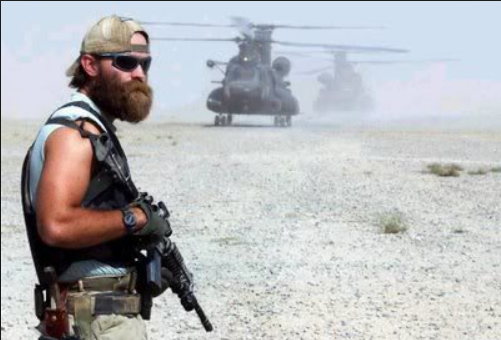 Just go with Mil-Spec instead of Commercial since it is stronger. 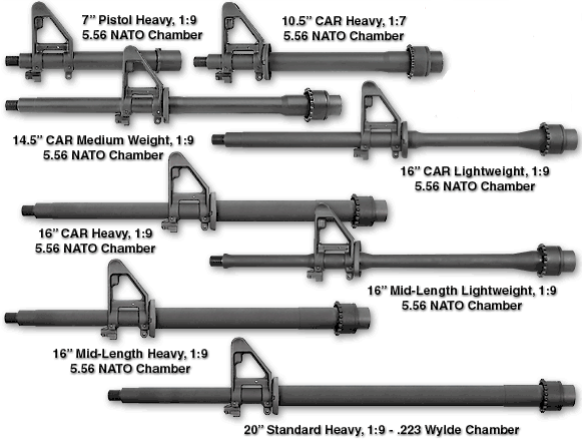 Also, make sure to match up the carbine/rifle lengths according to your barrel. I’d stick with the standard Mil-Spec trigger initially. It may be a little gritty at first but will become better with use. I like it for its reliability. 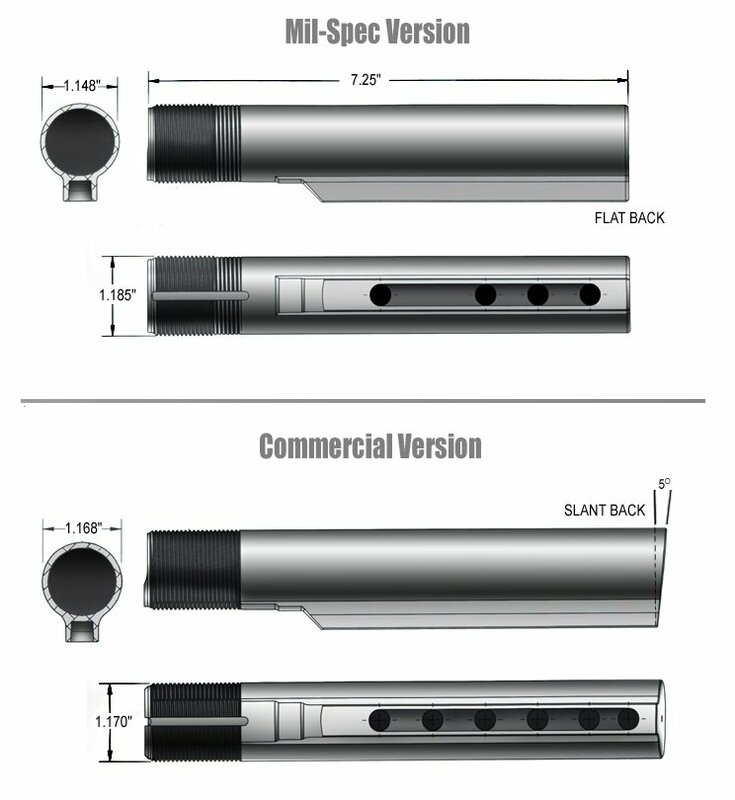 More precision rifles will use aftermarket single stage or two stage triggers. However, I will say that the first upgrade I would do to a rifle would be upgrading the trigger. Just stick with the stock one first…if only so you can fully appreciate an upgraded one! Check out our Best AR-15 Triggers list. Hands down…getting a better trigger is the best upgrade you can do to shoot more accurately. Again, we recommend getting used to your iron sights, stock muzzle device, and standard furniture before jumping into upgrades. You likely won’t know what you need until you get adequate range time. But of course, we’ve got a guide for that too…check out Best AR-15 Furniture & Accessories and Best AR-15 Optics & Scopes. We’ll cover the four main flavors, each with their own pros and cons. 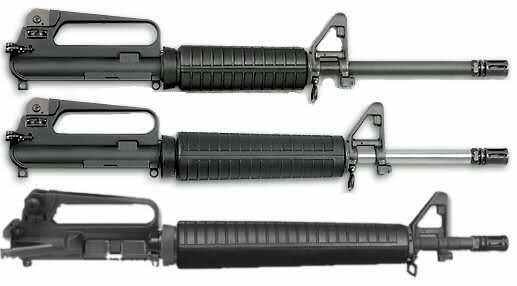 Known lovingly as the “M4-gery” (M4 + Forgery), this is the most common AR-15 type which seeks to mimic the M4 military carbine. While the M4 has a 14.5″ barrel with a carbine length gas system, most AR-15’s of this variant will use a 16″ barrel and a mix of carbine and mid-length gas systems. Most will have collapsible buttstocks so you can adjust your length of pull and eye-relief. M4gery’s span many varieties. The first rifle is more bone stock, with a carry handle, non-free-floating handguard, carbine gas system, and a front sight base. The second rifle has a flattop upper receiver with a 1913 (Picatinny) rail on top, the new KeyMod rail on the sides, free floated handguard, mid-length gas system, and low profile gas block. Varmint/precision builds likely will have an 18″ or 20″ barrel of the heavy contour variety for extra stability and velocity. The twist rates and materials may also change for more accurate combinations (1×8 or 1×7 and non-chrome-line or stainless steel). Oh…and get ready for some more acronyms such as Special Purpose Rifle (SPR) and Designated Marksman Rifle (DMR). Basically…longer barrel. Precision AR-15’s will also most likely have free-floated handguards and heavier buttstocks. 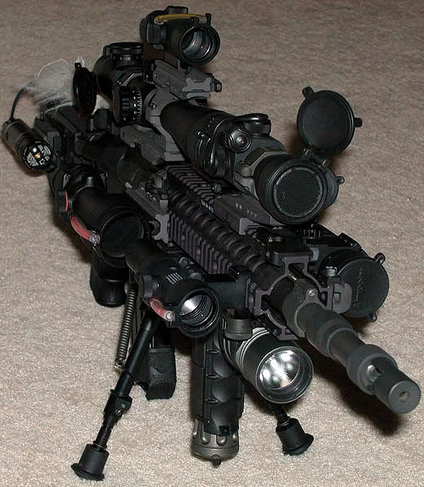 You’ll want to add a scope and probably a bipod too. Get ready for a much heavier rifle! We won’t be covering much of them in this guide, but if you do go this route, be extra sure of your state/local laws since you’ll be going with sub-16″ barrels. Traditionally this is known as a Short Barreled Rifle (SBR) which requires paperwork and a tax stamp. 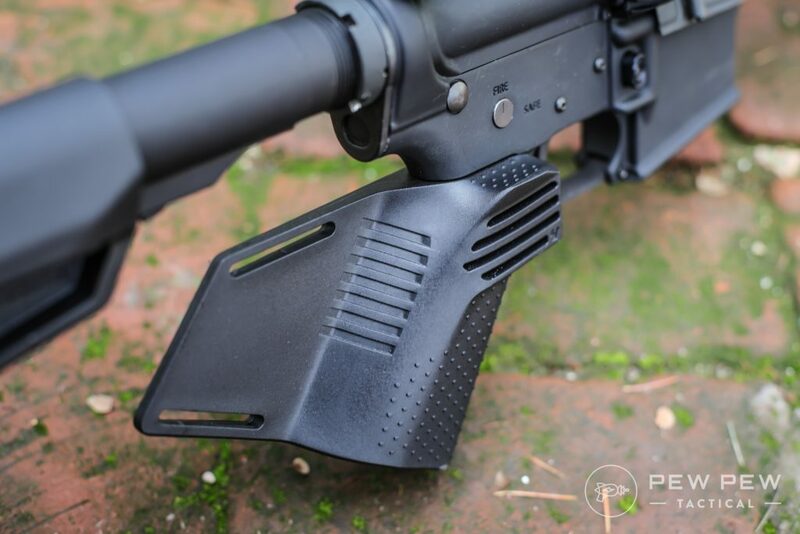 AR pistols generally require fewer steps but make the tradeoff of not having an actual buttstock. But now there are things such as “pistol braces” that the ATF allows for shouldering. Both make the tradeoff of a shorter, lighter, and easier to handle weapon. But the drawbacks include much-decreased velocity and increased muzzle blast (people around will HATE you). SBR’s and AR pistols are best suited for under 100 yards. Competition guns are specifically tailored race rifles for 3-Gun (rifle, pistol, & shotgun) or other competitions. Normally you’ll see longer barrels and gas systems coupled with big brakes/compensators to reduce recoil and enable faster followup shots. Almost everything else in the system is customized to the shooter. For the best out of the box competition AR’s…click here. It brings me great sadness to have to add this for 2017. But featureless rifles make it legal for residents of CA and NY (and probably more) to own AR-15 style firearms with accessible magazine releases. The biggest differences you’ll see are no pistol grip, non-adjustable buttstock, and no flash hider. For more, check out our Featureless Rifles page. Love it or hate it…people really want these groupings. These are my personal point of view and fluctuate through the years as I gain more experience. These are our perceived top quality manufacturers who don’t cut corners and can produce near 100% reliable guns (or they have an awesome marketing budget). If you’re looking for the best service grade (mil-spec) AR for self or home defense, we recommend going with one of these top tier companies who stand behind their product. These are great guns that might start out range plinking guns until they’ve proven themselves. We recommend putting at least 1000 rounds through with varying conditions, ammo, and magazines before you trust a gun with your life. The below is not an exhaustive list, especially with all the builders out there. Nothing wrong with these guns either, they are great starter AR’s because of their affordability and are perfectly capable of being reliable. Just test them out first. For a top tier, expect to pay $1000-1500 for a complete rifle, while mid tiers can start around $600. Remember, you’re paying for quality of materials, quality control, and R&D. Ok…and probably marketing too. Rifles are one item where the adages of “You Get What You Pay For” and “Buy Once, Cry Once” ring true. Alright, what you’ve been waiting for…some of my specific recommendations based on personal experience. Just because it’s not here doesn’t mean it’s not good, and just because I like it, doesn’t mean you will too. For such a large purchase, I would always recommend seeing these rifles in person at your local gun shop (LGS) so you can touch and handle them. Or you can online order them to your shop which should have an FFL (Federal Firearms License) to process everything. Might be just because my first AR-15 was a DD, but mine has never failed me. For a first rifle (or only rifle) I’d prefer one with an FSB such as the 16″ DDM4 V3 ($~1700) which also has the slightly softer shooting mid-length gas system. 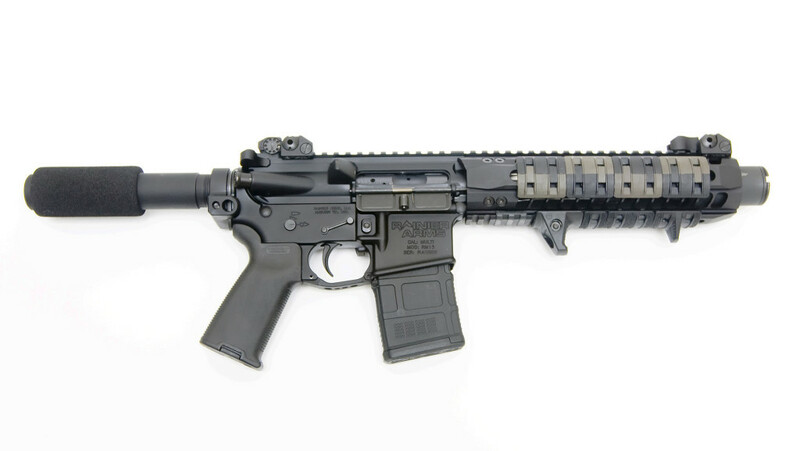 For railed systems also in mid-length, I’d recommend the 16″ DDM4 V7 (~$1600), or on the shorter side the or the 14.5″ carbine gas system DDM4A1 (~$1700) with a permanent muzzle device. Daniel Defense has the quality but I think it’s a little expensive. BCM in my mind is the best bang for the buck for top-tier stuff based on the several that my friends use and that I have extensively shot. I would get their mid-length 16″ MID16 Mod 0 ($~1200) with polymer handguard or the Mod 2 ($~1400) with quad-rails for a complete rifle. And for free-float, I would get either the Recce 14 or 16 (~$1500). All their rifles here. Another creme de la creme is the mid-length 16″ LWRC DI which has all the things you want plus a handstop and fluted barrel. Plus it comes in a super cool Stealth Grey Model ($1650). Good ole Colt has one of the best entry levels AR-15’s and the LE6920 ($1000) is one of the three that I recommend my friends who are just getting into AR’s. It might have the shorter carbine gas length barrel but it will eat anything and keep on truckin’. 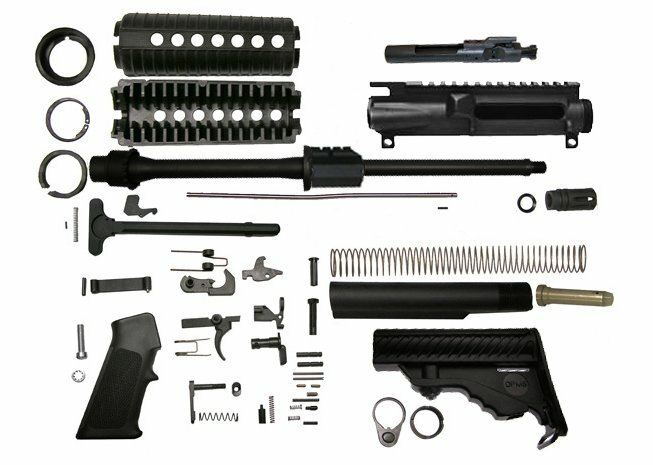 Or you can opt for the OEM version ($800) and follow our AR Furniture Guide to make your very own without the difficult assembly. Another well-known name, albeit probably more known in the revolver and handgun world. More budget friendly but also one of my top recommendations for an initial AR-15. Their entry-level 16″ carbine gas M&P 15 Sport II (~$700) sells like hot cakes for good reason and gets my vote for the most affordable first AR. 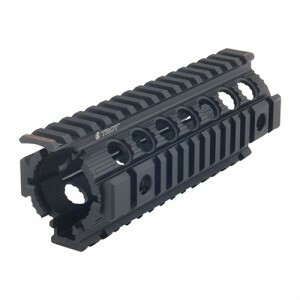 You can also opt for the M-LOK handguard ($700) variant for the same price…highly recommended. A well-known name if you’re into building your own AR (they make my favorite stripped upper+lower receiver). Aero has its roots in years of aerospace manufacturing and makes almost everything in-house (a rarity nowadays). 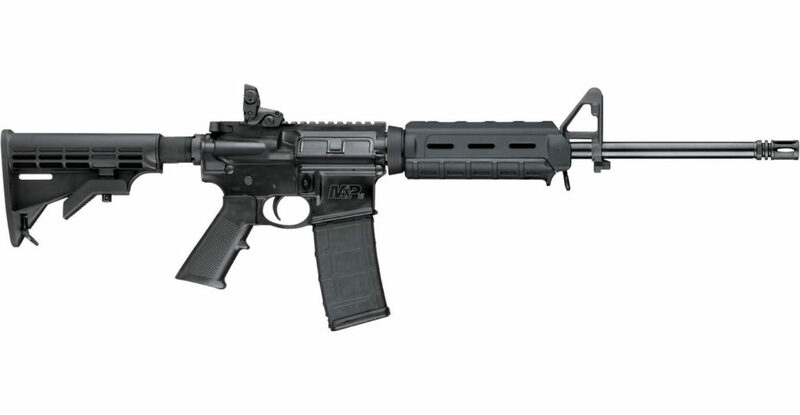 For best overall value in rifles that have a FSB, I’m liking their AC-15M 16″ mid-length ($689) that has everything you want (including the mid-length gas system, at the same price as the other affordable models from S&W). I’ve tested a couple of their free-float uppers on their lowers and my best stamp of approval is that its now my home-defense/SHTF rifle. You can check out my full review here. It’s kinda weird that their full rifles don’t have this combo…but you’re in luck since you’ll get to save the full firearm tax. If it’s out of stock or you like other handguards…check out the rest of their Complete 5.56 Uppers. Pair it with their AR-15 complete lower and you’ll never know the difference from purchasing a complete rifle. Make sure you don’t choose the M5 (different caliber) or Pistol (unless you’re building a pistol). M4E1 complete lowers are also great and come with upgraded buttstocks, grips, and better aesthetics on the lower (in my opinion). Balling on a budget? 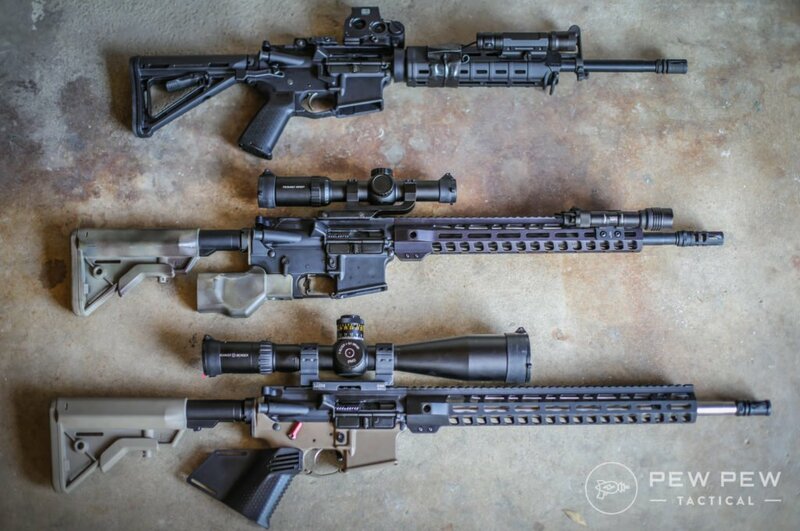 PSA makes everything in-house…turning raw materials to the finished AR-15 of your dreams. Find complete rifles (a lot of the times with free-floating rails) for around $600. Reputation is great too for rifles that simply work. Sometimes you’ll see some complaints about shipping times when there’s a large amount of orders. I’ve finished testing of three PSA rifles. Full review here. And…now with a video review too! They have a lot of complete rifles…and they go in and out of stock frequently as people gobble them up. But whatever you’re looking for…16″ FSB or 18″ free-floating rail with Magpul MOE furniture? They’ve got the variant. For the truly budget conscious go for the Freedom Carbine…otherwise I’d prefer a 16″ mid-length with rails (are you getting tired of me saying that)? Depending on the market…you might be better off ordering a complete upper and complete lower separately. Something about an 11% tax on complete long-guns. All you’ll have to do is connect them together with two pins. Easy peasy. If you decide to go this route, you’ll be able to have a bigger selection of furniture and rails (and the ability to get a sub $500 rifle). 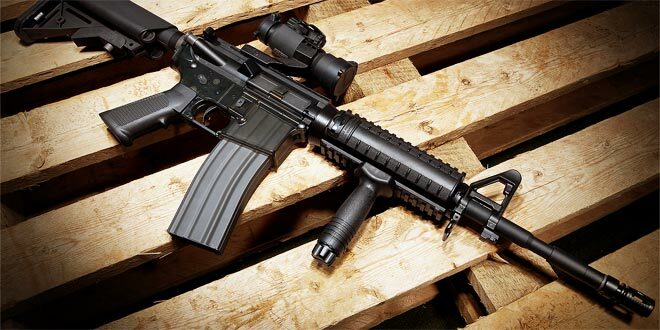 Check out Best AR-15 Uppers for my personal picks. 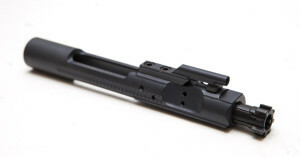 Make sure to get one WITH bolt carrier group (BCG) and charging handle (CH). And for lowers you can choose whatever style you like. I prefer the Magpul editions with either the MOE buttstock or the ACS-L.
Now you don’t have to worry about brass flying into your face or getting an ambidextrous safety. Stag Arms has been making left-handed AR’s for a long time and offers life-time guarantees regardless of original owner or even number of rounds fired. I like the Model 2L ($965) for flip-up iron sights (as opposed to the 1L that has a carry-handle). My best buddy has been running his for years for both plinking and even competition. For the folks in CA and NY. There has been a lot more activity here (Springfield and LWRC) but I’m holding off on adding everything until I can review them in-hand. The easiest is to buy a featureless at your local gun store or turn your current one following our Featureless Guide. I’d recommend looking at our Best Lower Receivers article and then following How to Build a Lower Receiver. But my advice is still…buy a complete rifle! Or at least two complete halves. I know we’ve gone over a lot, and your journey to getting an AR-15 has just begun. So think of all the criteria you want (including price point) and start looking. And once you do get one, let me know how it runs, and then check out the rest of the AR-15 Definitive Guides. I’VE BEEN LOOKING AT WILSON COMBAT AR PLATEFORM FOR A “HIGH END” RIFLE. DOES ANYONE HAVE ANY INSIGHT ON THE QUALITY OF THE RIFLE OF WILSON FOR THE COST? I ask because I don’t see much reviews of this particular brand of AR. Wilson Combat makes very high-quality products. 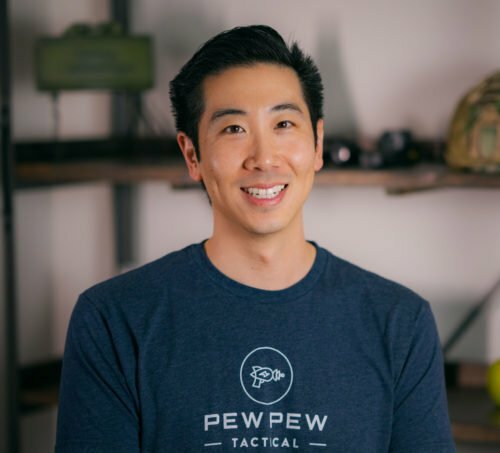 Their rifles, 1911s, and Berettas are all well respected in tactical and competition communities. If they are worth the price depends on you, you’re paying a lot for the name and the reputation – but you know for a fact that your rifle is going to be top-tier. I would go with the Vortex Strike Eagle 1-6x! 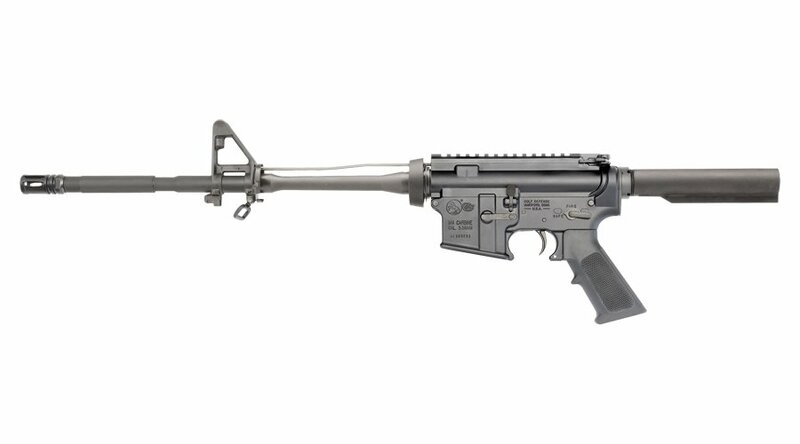 Does anyone have any pro’s and con’s on the Ruger AR 556 ? I bought mine a few weeks ago and love it. My only issue with it so far is after a few mags in succesion it gets a little hot, but that is probably just the stock handguard not handling heat well (and this is after runnign about 120 rounds throuhg in under 15 minutes). 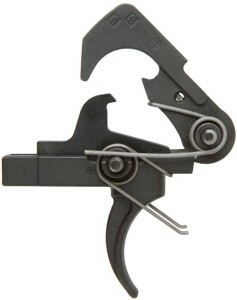 Other than that accuracy has been great, and it has been very reliable, I would definitely reccomend it for the price. As usual, no respect for Black Rain Ordnance. I love mine, it screams quality and is very accurate. Wonder why there’s no mention of Radian Model 1 or Battlearms Development on this site, is this stuff up to date?